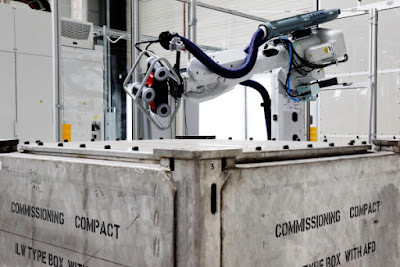 The Nuclear Advanced Manufacturing Research Centre (Nuclear AMRC) in Rotherham is working with Sellafield Ltd to slash the cost of making future designs of waste container boxes, potentially saving hundreds of millions of pounds in decommissioning costs. The Nuclear AMRC is the focal point for the civil nuclear manufacturing industry in the UK. Part of the Government's High Value Manufacturing Catapult, the £25m centre on the Advanced Manufacturing Park (AMP) helps to develop capability and competitiveness in the nuclear supply chain through process manufacturing innovation and R&D, driving up quality and reducing cost. Sellafield Ltd, which manages the decommissioning of the Sellafield facility in Cumbria, is driving a project to significantly reduce the cost of special steel boxes used to safely store and dispose of hazardous waste. It has tasked engineers at the Nuclear AMRC to help come up with solutions which could save the taxpayer hundreds of millions of pounds over the lifetime of the programme. Tens of thousands of these 3 cubic metre steel boxes will be needed over the next 30 years with each one costing tens of thousands of pounds to produce using existing manufacturing techniques. The research, part-funded by the Civil Nuclear Sharing in Growth (CNSIG) programme, focuses on the two most promising routes for cost reduction identified by Sellafield Ltd – optimising and automating welding of the container; and producing the lid flanges by casting instead of machining. Stuart Dawson, operations director at the Nuclear AMRC, said: "This is a challenging project requiring a fully multi-disciplinary approach, bringing together many areas of research, with the potential to deliver significant savings to industry. "With our world-leading capabilities and expertise, the Nuclear AMRC is uniquely positioned to address such complex manufacturing problems for demanding sectors like decommissioning." The Nuclear AMRC has also called on the specialist expertise of AMRC Castings, next door on the AMP – part of its sister centre, the University of Sheffield's AMRC with Boeing. AMRC Castings investigated whether the complex shape could instead be cast as a single item. Using the centre's Replicast ceramic mould technology, the team successfully cast two highly accurate, one-piece prototype frames. The frames have passed material and metallurgical testing, and exhibited a superior surface finish.